If you have already bought a domain name from GoDaddy and thinking to host it on a better web hosting service such as Bluehost, this page is for you. If you’re looking to connect GoDaddy to Bluehost, this page will help you! Don’t Miss: This year Bluehost Black Friday & Bluehost Cyber Monday deals to save 66% on Hosting Purchase. In this short tutorial you will find how to easily point your domain name from GoDaddy to Bluehost without much hassle. Quick Note: If you haven’t already bought hosting from Bluehost, click this special link to avail the best offers. You will get discounts as cheap as up to 50%. To point or connect your domain from GoDaddy to Bluehost, you simply need to change your nameservers and you will be done! I’ll show you how in this short tutorial. Here is a simple step by step tutorial on how to point your domain from GoDaddy to Bluehost. Step 1: Sign in to your GoDaddy account, click on “Launch” from the Domains tab. Step 4: Enter your updated name server information in the spaces provided under the blue Nameservers heading on the right side of your page and click Save Changes at the bottom. Now, you have successfully made changes to your domain at GoDaddy. You are now ready to point your domain from GoDaddy to Bluehost. To point your domain from GoDaddy to Bluehost (after changing your nameservers at GoDaddy), here’s the simple step by step tutorial you need to follow. Step 5: Log in to your Bluehost account. 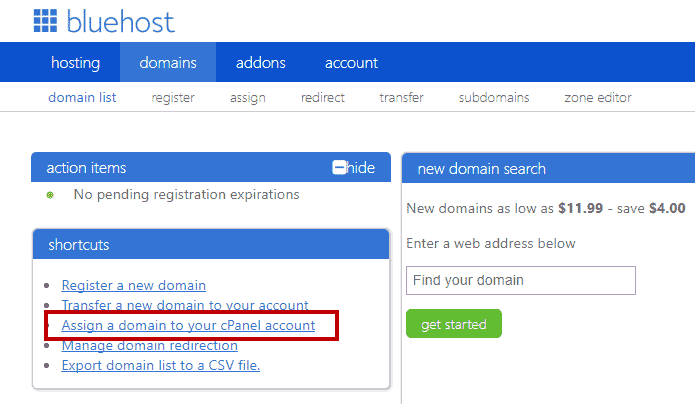 Step 6: Once you are on your Bluehost control panel, click on “Assign” under Domains tab and click on “Use a domain that is not already associated with your account” and enter your domain that you bought from GoDaddy. Note: In the above steps, we’ve already modified the nameservers at GoDaddy, so your ownership of the domain will be automatically verified! Step 7: In this step, click on “Addon Domain”. For your information, an Addon domain lets you create an entirely new website on your Bluehost account. Step 8: In this final step, you need to create a brand new directory (if you are setting up a new blog or website) and click on “Assign This Domain” for finishing the process! So that’s it! You have successfully pointed your domain from GoDaddy to Bluehost. Pointing your domain from GoDaddy to Bluehost is really simple. If you follow the simple 8 step tutorial, you will successfully redirect to Bluehost.